I printed off our printables onto 65 lb cardstock paper and laminated them. The doll food pictured is from Faux Real Food. The dolls are wearing dresses from Dresses for Dolls. 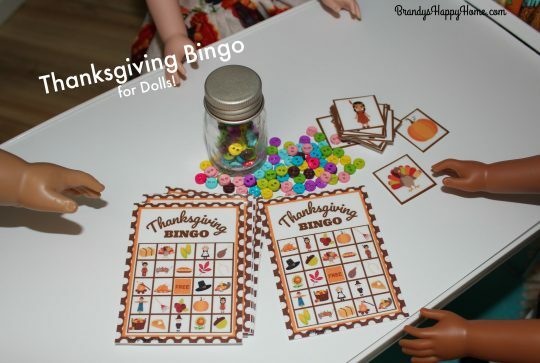 For my other “Around the Kid’s Table” posts see here: Thanksgiving Headbands for Kid’s and Dolls, Kid’s Table Craft Caddy, Roasted Pumpkin Seeds, Holiday Appetizers for Dolls. Craft on! *Graphics used in the “Around the Kids Table” series are from: Amanda Ilkov, Dorky Prints, Alef Clipart, Emily Peterson Studio, Winchester Lambourine, Google images, and Brandy’s Happy Home. Thank you! this is a great printable! You are very welcome Xyra! Happy Thanksgiving! 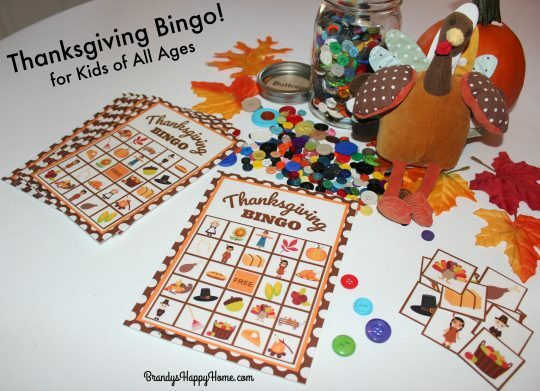 Thank you so much, Brandy, for the free Bingo and Headband Printables. They are so cute! So kind of you to share with us. I just wanted to thank you for another wonderful series and to tell you how much I appreciate you starting this early. I mail these to my grand daughters across country and it’s so helpful to have a little extra time! I also wanted to mention that clear ConTact paper does a wonderful job if you don’t have access to a laminator.